One of the biggest misconceptions in roofing is that roof leaks don’t occur during winter. However, this is not true. Your home’s roof can have a problem at any time during any season. And although most roofing is installed during warmer months of summer and spring that doesn’t mean that your roof can’t have problems during the cold weather of winter. There are some things you can do to ensure your roof is up to the threat of Jack Frost however. In this article we’ll take a deeper look at some things you can do to protect your home during the cold winter in Michigan. Your roof is far more important than you might think and far more susceptible to quick deterioration. Roofs keep out moisture, pests and keep your home structurally sound. But if something as simple as a cracked or missing shingle goes untreated for a couple weeks or months, you can end up with a severe case of mold, structural damage and even need a full roof replacement. This can become even more devastating during the winter months when there is a foot of snow on your roof and no end in sight. 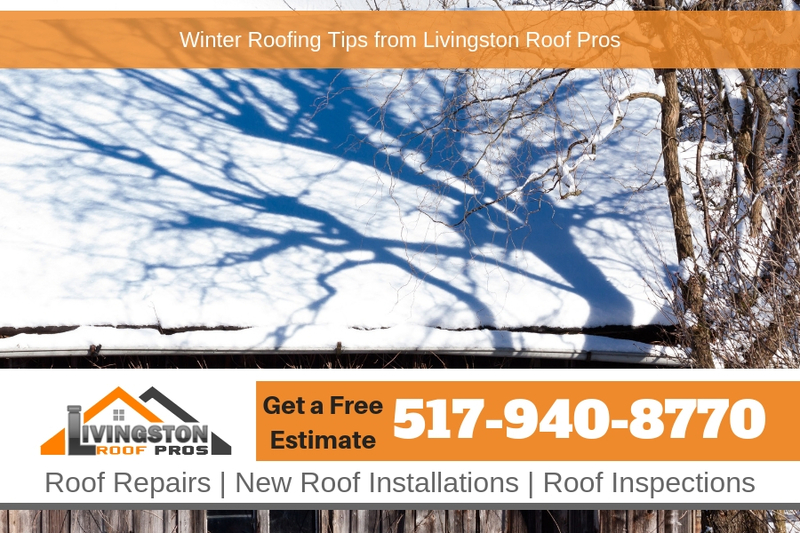 To keep your roof safe all winter long it is important to take some steps before the snow starts to fall. Snow storms mean freezing rain, hail, and potentially pounds of snow sitting on your roof can all lead to severe damage to your home. To prevent any issues it is important to prep your home and keep up some simple maintenance tasks. Making sure your home’s roof is protected is a must. Check for leaks: If you have a leaking roof this can already be a sign of major issues so any hint of leaks must be attended to immediately by a professional. Signs of leaks include water spots on walls or ceilings, moisture to touch and stains. Leaks typically happen in areas that allow moisture in, so in addition to places where the shingles are broken or missing, you need to check vents and flashing to make sure they are installed properly so moisture can’t get in. Fix all leaks: Leaks are a problem when they go untreated the rest of the year and leaving them untouched all, or even part of winter, can become a massive issue very quickly. Mold, rot and structural damages are all possibilities and the added moisture on your roof in winter can make these even more likely. Getting a professional out there as fast as possible will save you hundreds or thousands of dollars and a whole new roof. Clean your gutters and downspouts: Autumn winds can be a welcome change to the hot summer days, but the falling leaves that go with it can quickly clog your home’s drainage systems. When debris blocks your drains and downspouts it keeps the moisture sitting there and cause moisture to build up on your roof. This leads to shingle deterioration and moisture getting through to the sub-roof. This can cause mold, leaks and problems with your homes structural foundation. To prevent this you need to regularly clean out the gutters and make sure they are not rusted and in need of replacement. Have a professional check it out: Sadly simple problem can go unnoticed to the untrained eye and can cost us dearly. So to keep everything in good shape and ready for the winter, you should have a professional come out to professionally inspect it. Ideally you should have this done a few times a year, but at the very least you need to have a full inspection of your roof done before winter starts so you know you won’t have any problems when the snow starts to pile up.